Students are choosing to join a growing number of practitioners who understand that health is rooted in a balance of mind, body and spirit, and in our relationships and connection to others and to the environments in which we live. Each Diploma Program incorporates a comprehensive system of education, including critical theoretical studies, intensive clinical training, and interpersonal-social skills development which encourage students to embark upon a life-long path of intellectual, physical and personal mastery. Clinical Acupuncture Diploma (R.Ac): 2400 Hours (720 Clinical Hours) / 160 Credits (24 Clinic Credits). 3 Year Diploma (Can be completed in 2 Years Full Time. *Includes certification in Medical Qi gong and as an Acudetox/NADA Specialist. Acupuncture & Herbal Medicine Diploma (R.TCMP): 3325 Hours (990 Clinic Hours) / 221 Credits (33 Clinic Credits). 4 year Diploma (Can be completed in 3 Years. *Students with an Acupuncture Diploma can complete the diploma in herbal medicine in one year. Our Medical Qi Gong training is offered as three certificates - the 1 Year Medical Qi gong Educator, 1 Year Medical Qi gong Therapist, 1 Year Medical Qi gong Teacher and is led by the city's most innovative instructors. *Included in the Acupuncture diploma. This is one of the most comprehensive and affordable Acupuncture Programs available in North America. The 3 year Clinical Acupuncture Program at ITM prepares students for a rewarding career as a Integrative Health Professional specializing in Acupuncture. *Students may complete this diploma as an intensive 2 year program. 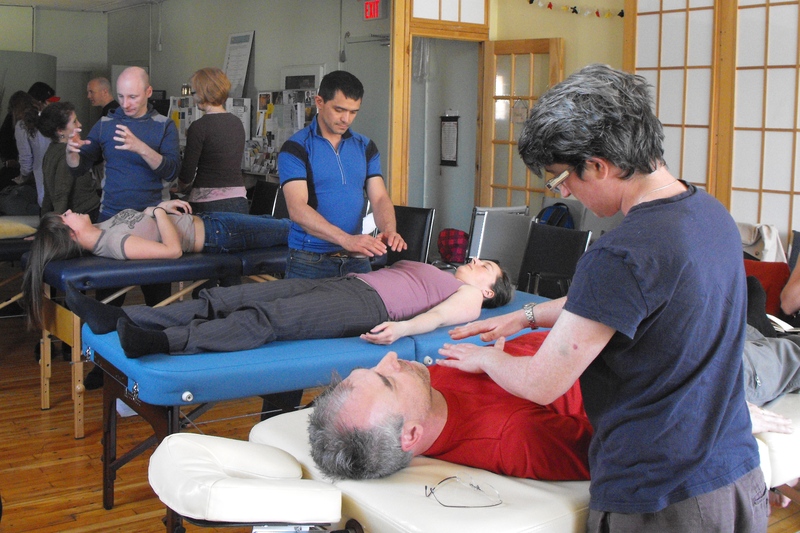 In two years, students enrolled in the Clinical Acupuncture Diploma Program will also receive certification as a Medical Qigong Therapist (no additional fees apply). ITM has created both a full and part-time study schedule that allows even the busiest of students to maintain a balance of work-life-family. Our programs offer a hybrid, in-class/online option - which means you can start at your own pace, from the comfort of your home. There are 3 terms per year - Fall: Sept-Dec, Winter: Jan-April, Summer: May-August. Classes are scheduled in the evenings (6-9:30pm) and weekends (10-6pm). Some daytime options are available as well. Students may also choose from a variety of clinics and workshops which are scheduled throughout the term, both onsite and offsite at our affiliate community organizations. the highest standard Diploma Programs offered in Canada, which surpass all current regulatory requirements both in Canada and internationally. Each Diploma incorporates a comprehensive system of education, including critical theoretical studies, intensive clinical training and interpersonal-social skills development, which encourage students to embark upon a life-long journey of intellectual, physical and personal mastery. Ready to find out more about our Eastern Medicine Programs? Drop us a line today and our Program Director, Henry, will arrange a visit or phone call with you. We have launched one of North America's most comprehensive trainings in Herbal Medicine with the most experienced and talented practitioners in the field. This unique program provides you with training in Eastern Herbology AND local Western Herbal Medicine. The focus of the training is Sustainable, Safe, Effective & Ethical Herbal Medicine. The care of the earth is our most ancient and most worthy, and after all, our most pleasing responsibility. To cherish what remains, and foster its renewal is our only hope. One year on-line/in-class program with a schedule that allows you to maintain a full-time practice/work-life balance while completing your studies. Meet one day during the week and on occasional weekends to fulfill in-class/clinical components, and supplement with on-line videos/lectures. Our program offers an in-depth study of Eastern Herbal Medicine with an introduction and awareness of Western Herbology to promote the use of local, sustainable and ethical uses of plant medicine. You receive training in medicine making; from tinctures, to salves, to infusions. We are proud to host the first vegan Eastern dispensary in North America. To create the most sustainable and ethical clinical practices possible, we provide alternatives to to animal products, encourage sustainable sourcing of organic products, and ethical wildcrafting practices. The Spirit of NADA creates a zone of peace within so patients can begin to experience their own inner strengths. ITM is one of Canada's main NADA/Acudetox training centres, and has trained hundreds over the last decade and half. The Acudetox Specialist/Practitioner Certificate includes training in the 5 Ear-Acu-Point Protocol, and is used to support those with Addictions, Trauma, Mental Health Conditions, Stress & Anxiety. (NADA: National Acupuncture Detoxification Association). NADA encourages community wellness through the use of a standardized auricular acupuncture protocol for behavioral health, including addictions, mental health, and disaster & emotional trauma. It is now offered in treatment centres, hospitals, community organizations and settings globally. The training is open to a variety of health-care professionals, addictions counsellors, therapists and acupuncturists. It's truly the best way to find out if this the school/program for you. Nothing is staged...you get to experience a day in the life of an ITM student. Meet the teachers, check out the clinic...and experience the environment of mindful, compassionate learning that we have created at ITM.Be a student for a day! Sign up and our will find the best day for your schedule. We are beyond honoured to work with some of the most experienced, skilled and generous practitioners in Eastern Medicine.